A towering novel about a towering figure, the legendary Liverpool soccer coach Bill Shankly. The rhythm and relentlessness of the prose captures as closely as I’ve ever read the feel and intensity of soccer, making this one of the greatest works sports fiction I’ve ever read. A city. A soccer team. A coach. A hero. A major achievement. Into these hard times walked Bill Shankly, a former Scottish coal miner who took over the city’s perpetually last-place soccer team. He had a straightforward work ethic and a favorite song – a silly pop song done by a local band, “You’ll Never Walk Alone.” Soon he would have entire stadiums singing along, tens of thousands of people all dressed in the team color red . . . as Liverpool began to win . . .
And soon, too, there was something else those thousands of people would chant as one: Shank-lee, Shank-lee . . .
David Peace – named as one of Granta’s Best of Young British Novelists in 2003 – was born and brought up in Yorkshire, England. He is the author of the Red Riding Quartet (Nineteen Seventy-four, Nineteen Seventy-seven, Nineteen Eighty, and Nineteen Eighty-three), which was adapted into a three-part BBC series; GB84, which was awarded the James Tait Black Memorial Prize; and The Damned Utd, which was adapted into a film starring Michael Sheen. Tokyo Year Zero, the first part of his acclaimed Tokyo Trilogy, was published in 2007, and the second part, Occupied City, in 2009. 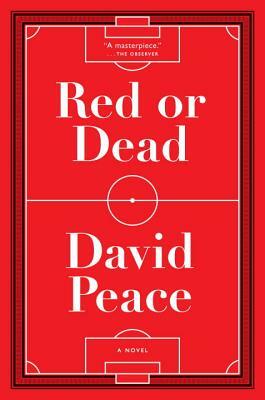 “I’d offer the British P.M. Red or Dead, David Peace’s demented novel about real-life soccer coach Bill Shankly... The novel is barking mad, but quite brilliant, and is a monument to a kind of magnificent decency once at the core of British life, but now rapidly fading." “Sprawling, ambitious and heartbreaking, it's one of the best sports novels in recent years." “Red or Dead might be seen as an elegy for that period when the game was played by and for the working classes and perhaps even seemed an authentic expression of their collectivist sensibility... In writing an elegy for Bill Shankly’s world, then, Peace suggests that what has been lost goes far beyond sports. Or to put it another way, he shows us ourselves in soccer." “David Peace’s writing reverberates in your head, pulling you along headfirst into the story... Red or Dead is a feat of writing. The manner in which Peace shares this history with us is just as important as the story itself. It’s not often that writing can transport you through style. Peace more than just succeeds in this. He excels."